I love a good contest and have entered many in blogland. I have even been lucky enough to win a couple over the last year. I have never wanted to win a contest as badly as I would like to win this one! 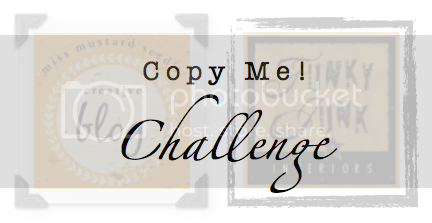 Donna at Funky Junk Interiors is having a "Copy Me" challenge. She says "it is your time to shine with your own version of my salvaged junk decor style!" "Simply link up a post that you feel emulates my decor style, and you're in!" "The winner gets to customize their own Funky Junk styled prize." So, I thought about linking up an older post (she said you can do that) or creating a new little project to link up but 1) our weather has not allowed for much of anything and 2) why create new when I have so much around here that represents her style? You really can't sum up her style in one little project anyway. It's not that simple and it's really not something you can copy. Sure, you can try to copy a project she did but that just doesn't capture the whole essence of her style. I don't like to copy anyone since I have my own style but she has definitely inspired me and validated the sometimes "off beat" things I do. So, here's my entry. Fingers crossed. RUST: FJI loves old rusty things. SIGNS: FJI is a sign maker extraordinaire. Handmade signs, found signs, old signs are all good. I wanted a huge old looking personalized sign, so I made one too. 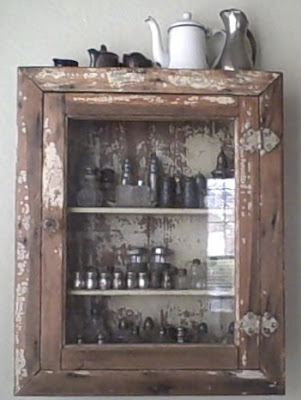 Use of interesting pieces (particularly industrial/architectural salvage in interesting ways: FJI is amazing at finding and using salvage pieces in very interesting ways. Layering and Ladders: To capture FJI's style, you need to layer and of course use a ladder or two. Personal touches: FJI incorporates personal touches that mean something to her while still capturing her style. Inspiration: How can you copy inspiration? Many of her posts inspire others. A recent post inspired us to do things we've always wanted to do but perhaps fear and risk kept us from achieving the goal. My pal, Jennie and I just opened our first antique booth in an awesome local antique mall. It was a huge leap for us. So, here's my entry into the "Copy Me" challenge. It's okay. I love my house and love my junk...and it was fun to participate. Great stuff. I really love sentimental personal touches like your dad's jeweler bits and glasses. The bit cases have a great worn look to them. Do you have jewelry he made for you? Congrats on your shop. Yep you are a definite Funky Junk twin. The style is totally you - love your signs. I love all your treasures! You have such a great talent and displaying everything. I've learned alot from this post. Thanks. I drooling over your ladder - I just love it. I love your style. All of your treasures are so wonderful. Love it all! Ooh I hope you win! Did I misunderstand? If you win, you get to have something made just for you? Hmm I better go read that again. And I was nodding all the way through your post until my eyes landed on that rustic shelving unit with all that incredible junk on it. Oh my.. caught my breath! Yes Gina, you totally have some wonderful funky junk in your home. LOVE your stuff! Great pics. Love it all!! I have JUNK ENVY! I have to go cruise your stuff...glad you entered the contest so I could snoop at your "house"! You have great junk! I loved seeing so much of it all in one post. It's Funky Junk, but Gina style. Very cool! Looove your ladder in the dining room and the shelf with all the "junk". Your light fixture in there is amazing. I also love the spring heart. I would so shop at your booth if I lived closer! Please come visit my blog I am having a big giveaway. Gina I LOVED this post....It felt like I'd popped over for coffee & you were giving me a tour....Of course I ADORE EVERYTHING but the standouts are the pieces you have from your Dear Dad....THOSE pieces ROCK big time....Oh & the little cabinet has my NAME on it....hmmmmmm....I see a SWAP looming in the future....hahahahaha....! I HOPE your shop is doing well....You KNOW if I were close by I'd be buying from you REGULARLY....!! congrats on opening your booth! you have a beautiful blog full of inspiration! have a wonderful friday! I love my junk in my home too.